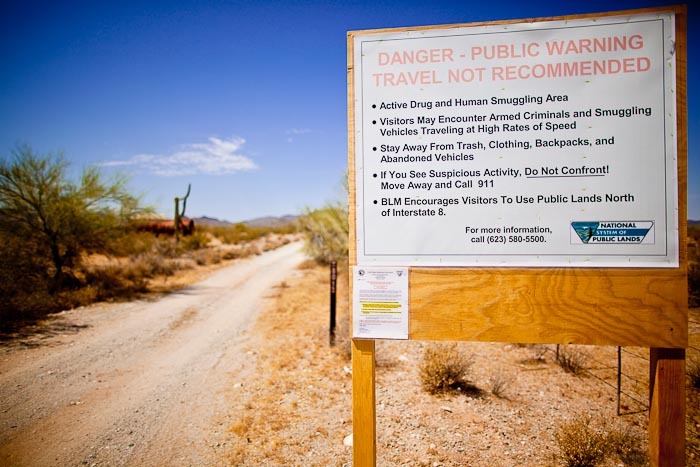 The Bureau of Land Management has put signs along Interstate 8 between Gila Bend and Casa Grande in the Sonoran Desert National Monument to warn travelers to avoid the area because of the possibility of running into drug smugglers and illegal immigrants. There is little disputing that immigrants and drug smugglers use the area - look at a map and you see that if you’re starting on the border and heading for Phoenix you pretty much have to cross through the area. But what’s open for debate is just how dangerous the area really is. A spokesperson for BLM says the signs are purely a precaution. A Pinal county deputy was injured in a shoot out east of this area but aside from the deputy no one has actually been hurt by either immigrants or smugglers in the area. Arizona Gov Jan Brewer has used the signs as a prop in her campaign for reelection. She’s seen standing in front of the sign scolding President Obama for his alleged inaction on illegal immigration and border security. She practically shouts into the camera, “Mr. President, DO YOUR JOB!” Arizona Republicans cite the signs as proof that the border is “out of control.” Others say it’s proof that Arizona is ceding land back to Mexico. The signs are certainly bad PR. When the Governor stands up and says they’re finding headless bodies in the desert (which is not true), that almost every illegal immigrant coming to Arizona is also smuggling drugs (which is not true) and that the federal government is losing control of border (also not true) it’s scares away the tourists. What is true is that what smuggling is taking place is a lot more violent. As border enforcement becomes stricter desperate people resort to more desperate measures. I’ve been photographing the border since 1995. I’ve photographed in every border state except California. There is less illegal immigration along the border now than any time in the past. On my first trip to border in Arizona, in Douglas in 1999, I went out to the border late in the afternoon and as the sun set it was like the start of a high school cross country meet. Hundreds of people ran past me, from Mexico to the US. That just isn’t happening anymore. But in this case the truth doesn’t make for good politics. There are more photos of the signs in my archive or available from ZUMA Press.